On Wednesday, January 15, I flew down to Mexico for a quick five-day trip to check on Whispering Jesse, our 1980 Valiant 40. Nan had flown down there the Saturday before and had assured me through text messages that everything appeared to be fine with the boat. After dropping off my baggage and saying hello to our friends at El Milagro Marina, where Nan had us staying, I drove our rented golf cart down to Marina del Sol, where the boat has been slipped since late last August, to check for myself. When I arrived at the marina, Gualberto, the dockmaster, was out on the pier checking lines. He and I shook hands and started talking about how the boat had fared, him in accented Spanish and me in broken Spanish and hand gestures, when someone pointed at the sky and yelled, "Mira!" (Look!). There was a water spout surging by on the Caribbean side of the island, close enough that we could see the water spiraling up and hear the hissing as it went. The photo here does not do it justice. The boat's exterior looked a little the worse for wear, especially the wooden cap rail and coamings. The sanding and Cetol finishing that looked so perfect after 2011's major refit now look flaky and dull. 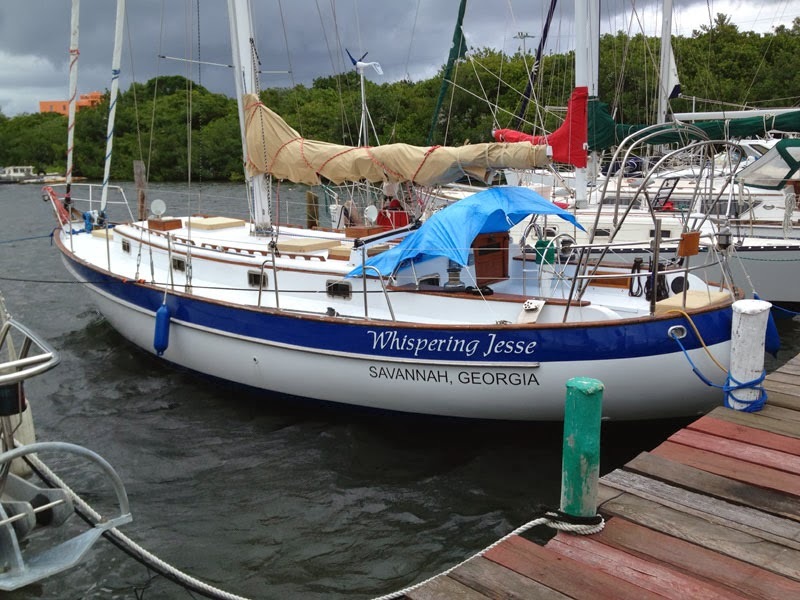 The protective blue plastic tarp I had rigged above the companionway, where the dodger would normally be, looked oxidized and ready to shred in a high wind. Inside the cabin, I checked the bilge and found it dry except at its deepest point. This was a relief. The stuffing box maintenance that Nazario and I had done last August was working to prevent much water from entering the bilge, and the bilge pump and float switch appeared to be doing their jobs effectively. Everything else inside looked exactly as I had left it, except for a light dusting of mold on most of the wooden surfaces. The boat has three dorades, cowling vents that keep outside air blowing in, but even with the fresh air, the humid climate inevitably causes some mold. 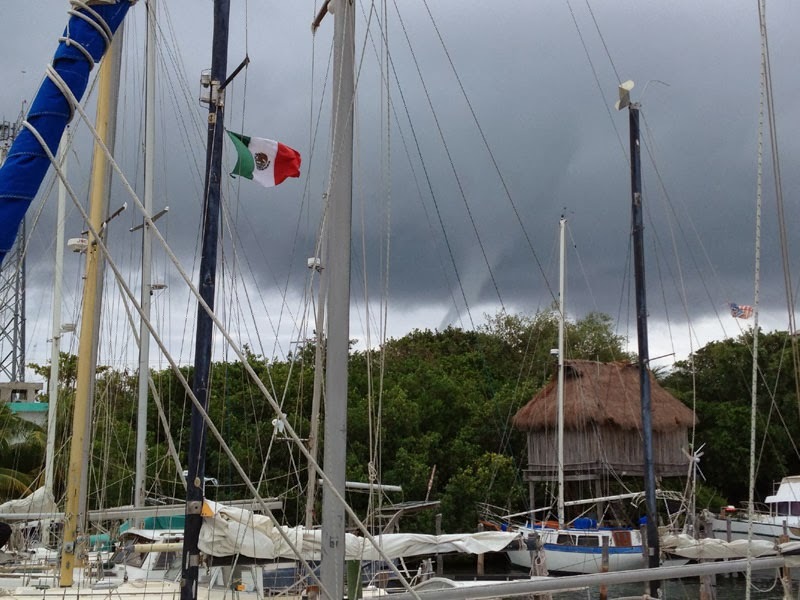 The original plan called for moving the boat to El Milagro that day, but the wind was howling out of the north, even in the protected lagoon where Marina del Sol is located. I didn't want to risk getting blown back into adjacent boats as I attempted to power out of the slip and make the immediate left turn necessary to avoid running aground in the lagoon's muddy bottom. The wind didn't let up the next day either, so with just three days left in the trip, it stopped being worthwhile to move the boat, get its canvas and rigging set for sailing, and then undo it all and move the boat back, all for maybe one day of good sailing. I spent the time on projects instead, starting with a refrigerator thermostat replacement. Charlie, who is sailing with his wife Karen on their Pearson 386, Leap, in the western Caribbean, looked at the refrigerator with me when they were in Isla Mujeres last summer. I told Charlie that the refrigerator would get "coldish," but not cold enough to keep food from spoiling. Right away, Charlie said that it sounded like a bad thermostat. That had never occurred to me, even after getting the coolant pressure checked three different times, and verifying that the compressor was working and that electricity was getting to the thermostat. When we were back in the USA, I compared photos to what was available online and found the right replacement at rparts.com. It took some effort to jiggle the old thermostat out of its tight fitting and get the new one connected up properly, but when I powered it up, I could feel the cold plate getting colder than it had ever been before. Pushing my luck, I filled a plastic ice tray, and put it in the little slot next to the cold plate. Sure enough, I had ice cubes the next day. Thank you, Charlie! Then it was time to attack the mold. I filled a dish pan with warm water and a half-cup of Clorox bleach, and went to work with an old dish sponge. The mold wiped off easily, but it still took more than two hours to wipe down every wooden surface inside the boat. With any luck, the bleach will keep the mold from growing back until we return in late May to sail up to Miami. As a final boat check, I started the engine and it fired right up. Everything seems to be working well, but the list of projects I have planned for when we get the boat closer to home is still fairly extensive. That's fine with me, though. It will be the first opportunity, since we bought the boat almost four years ago, for almost unlimited time together. As we begin the New Year, the arbitrary start of another trip around the sun for planet earth, I am reminded of a newspaper article I read back in September when we were in Wisconsin visiting family. In the article, NASA announced that in August 2012, the Voyager 1 space probe had flown beyond the heliopause (the limit of the sun's solar wind) and entered interstellar space. Voyager 1 was launched about 35 years ago, on September 5, 1977, and has been traveling at almost 38,000 miles per hour for that entire time. It is more than 12 billion miles from the sun now. To put this in perspective, the article stated that in order to reach the nearest star, Proxima Centauri, located 4.24 light years from the sun, Voyager 1 would need to continue at its present speed for another 40,000 years. Yes, 40,000 years! I looked up at my father across the breakfast table to confirm that he had read the article. "Forty thousand years!" I said. He chuckled and said, "Humankind will be long gone by then!" I think he's probably right. We are making our planet unlivable at a furious rate, and there's nowhere else to go. Mars? It's already what the earth will eventually become. We are stuck here with the mess we've created. 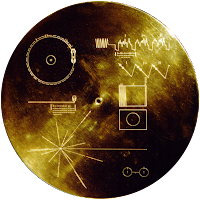 There's a golden record aboard Voyager 1 containing a wealth of audio and visual information about life on earth. If the record is ever discovered by intelligent life, it will serve not as an invitation to come visit but as a relic of what once was.